Each year, the Office of First-Year and Transfer Programs, in collaboration with a number of University departments, hosts Syracuse Welcome, the University’s new student orientation program for incoming, full-time, undergraduate students. The Goon Squad will be on hand to help new students move in. 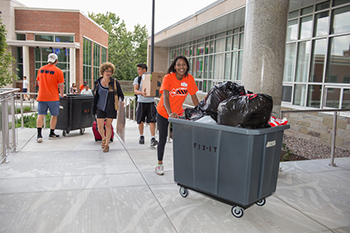 Preparations to welcome the more than 4,000 first-year and transfer students are well underway, including recruiting volunteers to assist with move-in. Staff, faculty, alumni and friends can still sign up to volunteer on either Wednesday, Aug. 24, or Thursday, Aug. 25, by visiting the Syracuse Welcome volunteers page. In addition to greeting and assisting new students and their families with moving into their residence halls, there are a number of activities and programs planned throughout orientation. Taking place before move-in are 11 pre-orientation programs, designed to bring a small group of students together around a common interest, ranging from a program for first-generation college students to community service-based experiences to outdoor adventure trips. One of the signature events during Syracuse Welcome is the New Student Convocation, which will be on Thursday, Aug. 25, at 5:30 p.m. in the Carrier Dome. This hallmark event formally welcomes new students and their families into the University community and includes the faculty processional, a faculty address and a welcome from Chancellor Kent Syverud. Students and their families will then head to the Quad for a picnic, followed by the student tradition Home to the Dome. On Friday, Aug. 26, students will attend Dean’s Welcome meetings and various academic advising sessions with their school/college. The orientation will also include activities into Labor Day weekend, such as trips to the New York State Fair, white water rafting and late-night shopping at Target. Orange After Dark, the late-night programming series for undergraduate students sponsored by the Division of Student Affairs, also has a full schedule of events. “The schedule throughout the first few weeks provides our students with ample opportunity to build University, academic and community connections,” says Abbott. For more information about Syracuse Welcome or to view the full schedule, visit the ReadySet website or download the Syracuse Welcome 2016 Guide in the Guidebook mobile app.